We woke early the next morning. Having let the fire go out the hut was freezing! Nice and warm under the duvet with Custard wriggled in between us, flat on his back, paws in the air, quietly growling in his sleep, but the hut was so cold you could see your breath. Leaving the somewhat useless men in bed I hopped out, pulled on boots and a jumper and got the stove going again. Popped a kettle on top and poked my head outside. Our little meadow was ablaze. 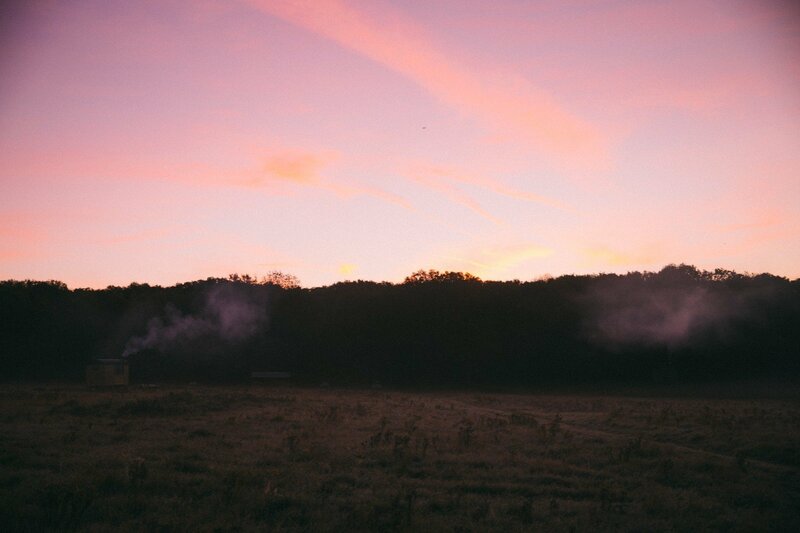 Bathed in the most sensational pink light, with frosted ground and mists rolling in. Even Custard couldn’t resist coming down to watch! 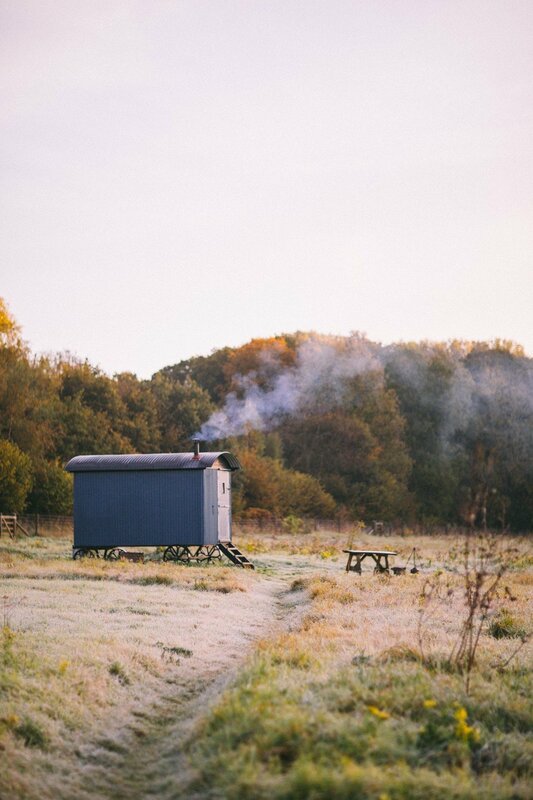 As the fire crackled away and warmed up our Wriggly Tin, I sat and watched the mists rolling in over the woods. The crisp, frosted ground was too much to resist. We got wrapped up and went for a pre-breakfast walk. And a much needed leg stretch! Snugg as a bugg in fresh fresh UGG boots and gloves! Having worked with them on their Luxe boots earlier this Autumn, I just couldn’t resist a pair of their classic chestnuts. There’s something so wonderfully appealing about a girl in skinny jeans and a beautiful pair of classics. Jeans tucked into cosy, soft shearling. It’s one of my favourite casual fashion silhouettes. Worn with the self assured feeling that she’ll be warm and comfy all day. By the time we got back from our frosty walk, the hut was positively tropical! The Mr lay the campfire, and I laid the table for breakfast. Still coated in a layer of sparking frost, and adorned with nature’s finest decorative accessories. 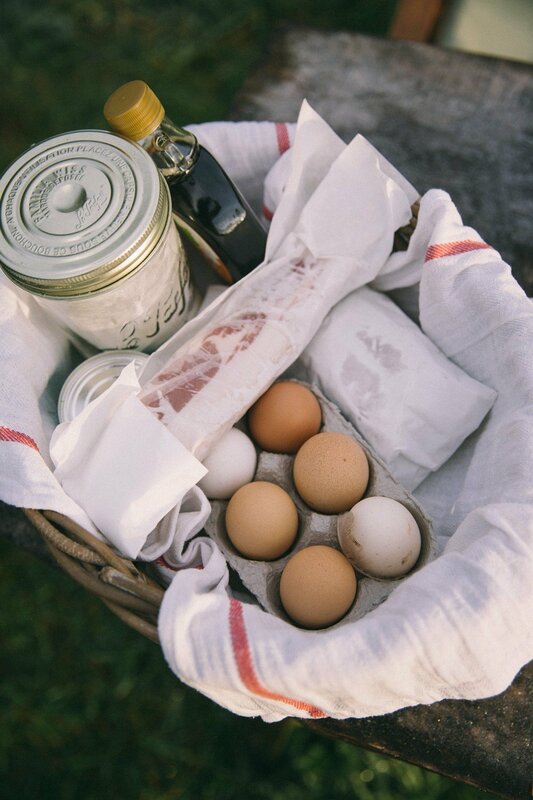 Alex, the camp chief, delivered a basket of breakfast goodies. Local bacon, local sausages, local eggs, bacon and beans. I had a few tricks up my sleeve too, so got started on breakfast. If you plan on giving Glamping a go, you need to give Campfire Pancakes a go! Seal it up and pack it in your kit. When you’re ready, crack in a large egg. 1 tablespoon of melted butter. Seal it up and shake the hell out of it! Keep going until you have a thick, smooth batter. If it’s not going runny, add a little more milk and try again. Place on one side until you’re ready. We fried up the bacon from a farm nearby, with sausages already sizzling away. Our smoke and that of our neighbours drifted across the clearing, mingling with the sitting mist. Not a bad view with your morning cuppa! We drank many a bucket of tea, keeping the mugs warm at the edge of the fire. Once the bacon was nice and crisp, the sausages well and truly cooked through, we started on the pancake stacks. Pop a little butter into a hot pan, and pour in your mix. Repeat until you run out of mix! Keep the stack warm near the fire, while you cook the rest. And when you’ve made as many as you think you can, drizzle in the good stuff. As we ate happily, the sun came up over the treetops, turning the view from shades of grey into glorious technicolour. Totally stuffed, we took Custard for a walk through the newly glowing woods. ^ Giving Mr Custard the fright of his life! But he soon forgot, and went back to hunting squirrels, and the elusive postman.